Thanks a million to all of you! In late June I crossed over the 1,000,000 lifetime pageviews, so I can officially say that I'm a millionaire at something. The first million is the hardest, right? I know it hasn't been the fastest that a blog has been able to reach a million views but I can honestly say it's been a lot faster than I expected. Especially after the painfully slow start. Don't believe me? 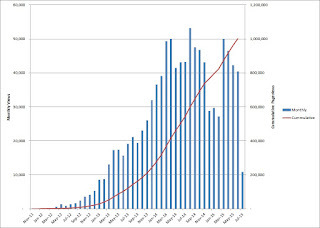 Here's a chart of all my monthly pageviews as well as the cumulative total. I didn't cross the 100,000 lifetime views until my 20th month. Of course blogging is a lot like dividend growth investing. It takes time to build up an audience just like it takes time to build up a portfolio of some of the best companies in the world. And now the hard work from the previous 3.5 years is paying off. In most months now I can get between 40 and 50 thousand pageviews. That's absolutely phenomenal to me! Personal finance and investing continues to be a taboo topic in our everyday lives which is why I love being a part of this dividend growth investing and blogging community. Thanks to this great blog network there's a ton of people that I can contact to bounce ideas off for just about anything. It could be an investing idea, valuation models, how to grow my blog or just about anything. I don't think I've run into someone yet that hasn't been ready and willing to help with any questions that I have. It's such a supportive group and having a bunch of like-minded individuals pushing me along continues to motivate me. It's always inspiring to see the new bloggers come onto the scene because I remember what it was like to be in the very early stages of blogging and investing. Everything is so new and fresh and the excitement at the very beginning is through the roof. Things will get harder and some bloggers have dropped off the scene, but for anyone just starting out don't give up and stick with it. Even if your blog doesn't become the leading source on any topic and you couldn't even dream of pursuing blogging full-time, the benefits of the community are worth far more than anything else. It's been a great 3.5+ years and I have complete plans to continue this journey for another 3.5 years and more. I have a lot of ideas floating around my head for where/how to take my blog but unfortunately nowhere near the available time to address those ideas fully. For starters I need to carve out some time to get my blog swapped over to Wordpress and self-hosted. That will open up a whole lot more possibilities for where I can take my little home on the internet. Something else I'd really like to get done is to get a logo designed for Passive-Income-Pursuit. It'll help to make things more cohesive across the various media avenues. Those are just two things on my list of things to do and if anyone has any help/thoughts/guidance on those feel free to pass them along. Thank you all for following along and as always if there's anything in particular you have a question about, feel free to ask. Also, thanks to all of you for helping to make this dividend growth investing and financial independence community what it is. I continue to learn from all of you and you all keep me motivated to push through towards my goal of financial independence. I expect the next million to come a lot quicker. Assuming that traffic/pageviews return to the norm from the second half of 2014 then it should be about 2 years. I've got a lot of ideas for where to take things from here and now I just need the time to execute. Congratulations JC!! This community is definitely awesome! I love it. Such a great outlet. I believe in tracking our progress on this journey and by focusing on the numbers constantly, we will be able to blow our goals away for sure! Wish you and your family the best bud. Take Care. Completely agree that this community is awesome. I don't have anyone in my day to day life that is interested in investing or personal finance so the opportunities to bounce ideas off one another is lost. But that's where this great community comes into play. I wish you many more pageviews in the future! Even if you don't make much blogging, I believe it is worthwhile to connect with other investors, and exchange experience/gain from each other's knowledge. I always figured blogging would just be a side income and that's about all that it is right now but there's a lot more benefits to blogging other than the earning potential. The idea exchange and dialogue makes it worth it. You inspire me. My poor blog has less than 10k views cumulative. And most of the views are on an off topic post about Godzilla I did one night on a lark because it made me laugh. On to a MEELYON! Don't get discouraged about your blog at all. It took me a while to cross the 10k mark as well. It's funny to see how non regular readers end up finding your posts. I have a couple posts that continue to get a bunch of hits despite them being a couple years old. Looking forward to my next million! Congrats on an impressive milestone! I love reading your blog! The information you provide is fantastic and no doubt used by many in the investing community. That's what my hope is. I just want to inspire and help to educate others. And of course learn from everyone else that's in this great community. Congrats on the milestone! Keep the content comming! Thanks so much and I hope to be a lot more consistent with my writing over the next few months. Of course not only does that mean that I'm putting out content but it would also mean my son is doing better which I'm looking forward to. Congrats, that's a huge number! I hope to get there eventually. If you stick with it your traffic will continue to grow and you'll get there. Thanks so much and I know I pull a lot of traffic from your website. The progress definitely does build on itself and a little bit extra done today leads to an improvement tomorrow. I'm officially a millionaire now! Congrats JC. 1 million PVs is quite an accomplishment. I wonder how long it will take to hit 2M. I assume PVs are like dividend snowballs. I've definitely noticed that they compound, although I'm not quite sure if it's at the same rate. 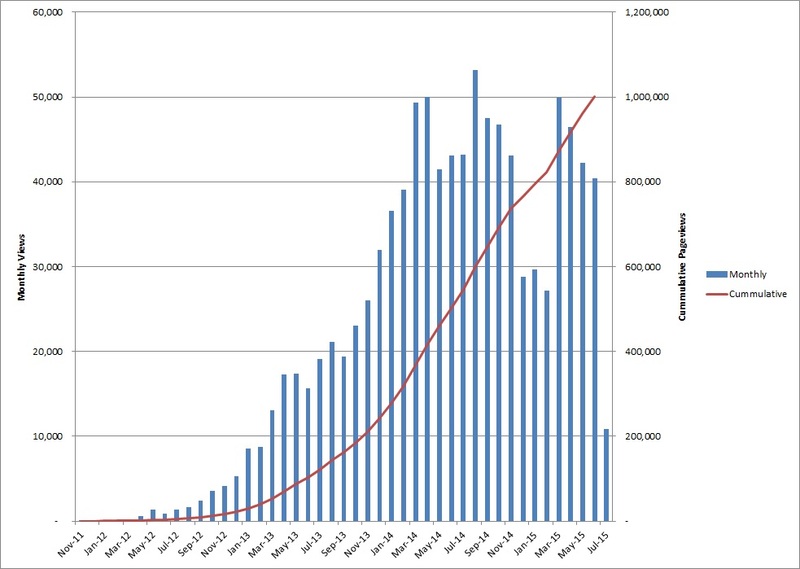 Based on current traffic trends it should be around 2 years to cross off the second million. Although I should hopefully be able to move that up some. Wow! This is an amazing milestone, JC. Big congrats, well deserved and thanks for making us all better investors! I wouldn't be as confident in the dgi strategy today if it weren't for soaking up all your posts and shared information. You were the second comment ever on my blog and it was like hearing from a celebrity, so keep up supporting the newer blogs because it means so much to us. I've really enjoyed sparking a friendship with you over the last year and am wishing you lots of continued success to come! Your comment means so much to me. While I'd love to earn a "living wage" from my blogging activity I'm doing this for two main reasons. 1. to connect with others to discuss topics that I don't talk about in my regular day and 2. to be able to educate, inspire, and motivate others. I remember what it was like to start out and have so few people knowing about my little place on the internet so I always try to go check out the new or new to me blogs and leave a comment. I just saw this post. Congrats, that's a huge blogging accomplishment. You're providing a lot of useful information for the community. Keep up the good work! It's pretty cool to see a second comma in my pageviews total. Now if only I could get that to my portfolio just as quick. Although my net worth my get to that level in another 4-5 years depending on where the stock market is at the time. What a great achievement JC...1,000,000 lifetime views is an awesome feat!! We've contributed to some of those views. :) Keep it up my friend, we will surely be here when you post your accomplishment on the next million. With the 30-40 thousand visits a month these days, your next million should come much quicker than the last. It's great to be a millionaire at something, although I can honestly say I'd prefer it to be my portfolio value. But it's great to know that I've reached out to that many people over the time I've been blogging. I expect the next million will be a lot quicker to reach because as long as the content keeps coming the pageviews compound on each other. And with as many new bloggers as there are in the this community it should continue to grow. Epic milestone. I'm still not progressing very quickly.